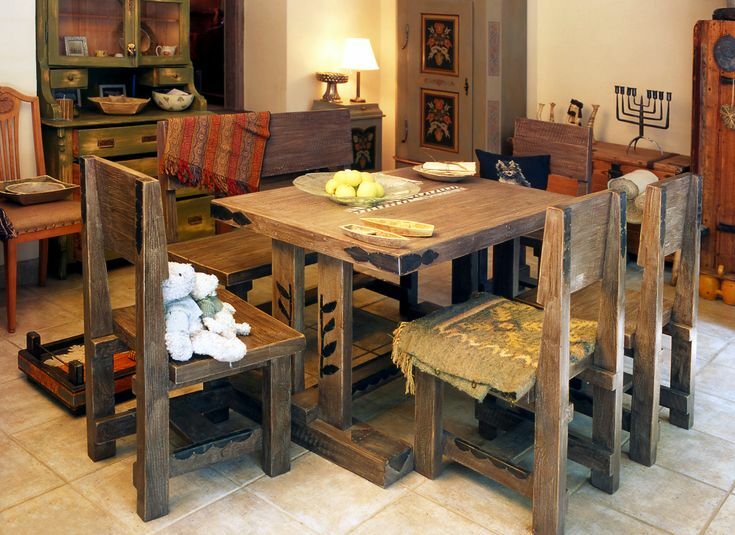 Some of the most fashionable tables are rustic and made of old wood and simple designs. Rustic wood tables are practical and can take hard knocks without spoiling the overall finish. These tables go back to the days when people lived in long cabins and there were no prep tables or wood butcher blocks to carry out food preparation. The tables of old were made as the centerpiece of the kitchen where food was prepared and eaten. It wasn’t just a piece of furniture, but a functional part of day to day life. Rustic decor is traditionally simple and straightforward, uses natural materials, and has rough finishes. Rustic tables play on nostalgia and the old days of pioneering. It is rough and unfinished but comfortable and fits well in modern kitchens. A lot of rustic tables are rectangular in shape and thicker than normal tables. These tables can be hand painted, finished, or designed in a way that suits your kitchen. Other items can help make your rustic table stand out, like oil lamps, ceramics, tile floors and baskets. Newer rustic tables are designed with a polished top that has to be well maintained. Some of the more common types of wood used in rustic tables are maple, hickory, pine and spruce. The most popular wood used is pine, which is what most settlers used in the old days. Pine is less expensive than most other woods. Walnut is another popular choice because of the grain patterns, it’s also a lot more expensive. Rustic tables are available in many types of woods and pine is the most popular because of the cost. It is easier to form pine into the shapes required than it is for other hardwoods which is great for interesting designs. Most people these days use custom kitchen furniture and working areas for food preparation so rustic tables are used mainly for eating. Rustic tables these days are very expensive which explains why tables aren’t used for food prep. Wood is now very expensive and can be difficult to get hold of, which is why the price is so high. Many people still prefer to have their tables made to order so it’s unique and they have the only one. These services can be provided by craftsmen or larger companies. They can make these tables to your exact specs and in any design you want. Go to a few stores and check out their designs to get and idea. You can also buy old rustic tables from garage sales and the internet. Whatever option you decide upon, rustic tables look great in any setting, but even if your kitchen is not a rustic design they still look great and provide the functionality you’ll ever need.